"The child is born with a high complexity, with existing determinants that never waver through its entire life." Watching The World Within: C.G. Jung In His Own Words gave me college psychology class flashbacks, and trust me when I say that my collegiate days are decades behind me. There was a sensation that I should be furiously taking notes as I attempted to sift and filter what sort of quotes or nuggets might appear on some imaginary future exam. That strange sense of being a student is front and center for the duration of this hypnotically slow 1990 documentary about the iconic Swiss psychiatrist, whose profound work explaining the complexities of the human psyche via dreams, art, and fantasies is still held in high regard. 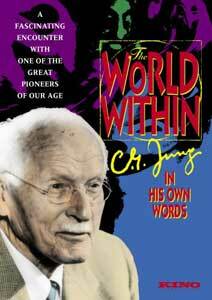 The core of the 62-minute The World Within is a 1957 Swiss television interview with Jung, here sporting a missile-sized lapel microphone. Clutching a pipe and looking every inch the deep-thinking analytical psychiatrist, Jung launches into startlingly concise and understandable explanations of how we are all "born into a pattern," as the fuzzy edges between conscious and unconscious merge. And it's when Jung himself is talking that this doc truly sails, because the concepts presented are both simplistic and complicated, providing a little clarity on, perhaps, why we are the way we are. It's the rest of this feature that tends to fall flat, as the interview footage is broken up by a mellow score played against an array of images, ranging from bomb blasts to tribal masks, as text scrolls of Jung quotes appear. That's really what gives this the classroom feel, and as a result, makes a viewing somewhat tedious. We're given a glimpse into Jung's Red Book, where his drawings are meant to explore his own dreams and fantasies, though during the course of this documentary they seem to only exist as daisy chained bits of randomness. I'm sure someone out there will accuse me of being some kind of simplistic moron, unable to withstand 62 minutes of highbrow thinking without feeling my eyelids start to become heavy. But I contend it's the presentation that's at fault, because hearing and seeing Jung talk about his theories and beliefs is fascinating, and I would have preferred just watching the Swiss television interview in its entirety. Instead, The World Within is sliced and diced into a documentary that operates under the assumption that scrolling text and trippy imagery is a substitute for simply hearing one of psychology's great thinkers talk. Image Transfer Review: Presented in its original 1.33:1 aspect ratio, this Jung doc is hardly a visually stimulating treat. It appears to have been dubbed sloppily from a VHS copy, and the resulting mass of smeary colors and incredibly soft edges makes this one look it was excavated from a centuries-old time capsule. Curiously, the black-and-white Jung interview footage from 1957 looks the best of all. Audio Transfer Review: Audio is provided in 2.0 stereo, and aside from some periodic hiss and crackle, it's a rather plain mix, devoid of any sense of depth. The 1957 interview footage of Jung is sometimes difficult to understand clearly, but the moody score from John Adams also plays flat. Extras Review: The extras here will probably excite Jung buffs, as the three-part Remembering Jung series features extended interviews with celebrated associates of the psychiatrist. As with the main doc, this is a little on the dry side, but for those hungering for a deeper insight, then the bios and input of Sir Laurens Van Der Post (21m:18s), Gerhard Adler (30m:11s), and Liliane Frey-Rohn (27m:10s) will be most welcome indeed. The disc is cut into 6 chapters. Hearing and seeing Jung speak�courtesy of a 1957 television interview�is certainly the selling point of this rather dusty educational doc that seems to have appeal only to students studying the legendary Swiss analytical psychiatrist. For the rest of us, I imagine this will be as dry as unbuttered toast, except when the jovial pipe-smoking Jung is elaborating on his thoughts on fantasy, dreams, and the like. A poor video/audio transfer only makes this even more of a chore to recommend to anyone but loyal Jung-ophiles.